While in town to visit the grandparents, what visit would be complete without a traditional dinner out? 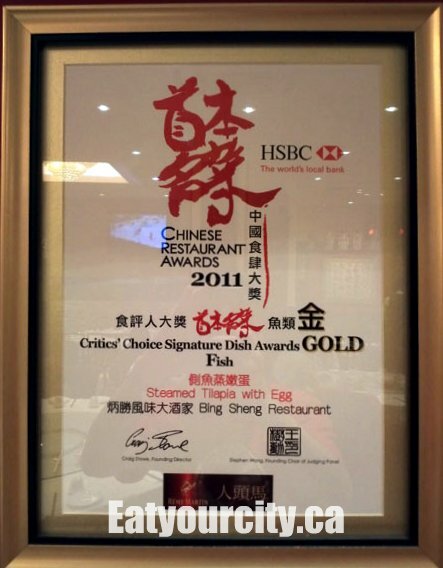 This time around, we made reservations at Bing Sheng, known for its award winning fish, so that's definitely on our list to try tonight! 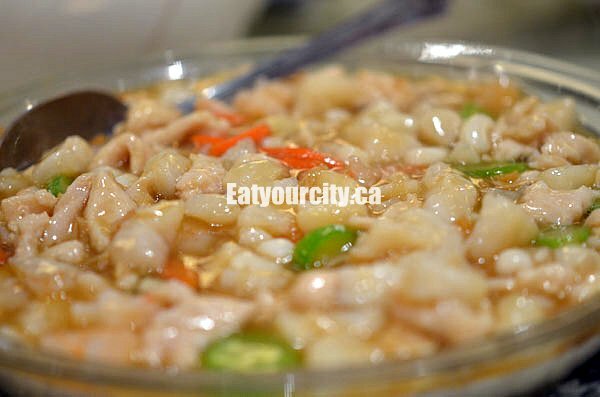 The exterior isn't much to write about, with the quintessential red, black and gold decor interior ubiquitous at most Chinese restaurants contrasting with its very demure exterior. We settle in and everyone starts to pick items of interest off the menu. Service was very fast and our waiter was friendly and attentive (for a Chinese restaurant). Little chicken biscuits 雞子餅 or "guy zhai beng"
These little chicken biscuits" is a traditional Cantonese favorite, and the first time I've seen it in Canada. The last time I had these was in a little quaint shop in Guangzhou, China. They are a crispy exterior with slightly chewy interior cookie shaped biscuit with a salty preserved tofu "lam yue" umami flavor, and frankly, the more the better! 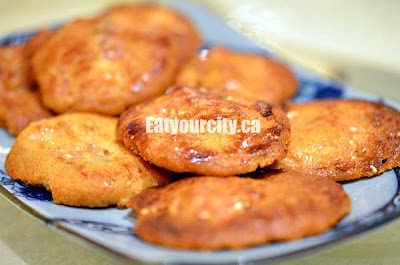 Be careful if you're watching your diet, as these savory and rich cookies/biscuits/sinfully delicious rounds are made with full on 100% lard... oh yeah baby! Its not "authentic" unless its made with plenty of pure pork fat! To make myself feel a little better about eating these, I picked out some of the small visible white chunkies of fat. This version was decent, though it was lacking a bit in the "lam yur" department, but it was nice to see my grandfather enjoy them... he hasn't had them in many many years and was delighted to eat them! Stir fried sticky rice 乾炒糯米飯 or "gone chow lor mai fan"
Though plated attractively with a sprinkle of very yellow-yolked scrambled eggs as a garnish, we were a bit surprised despite the bits of Chinese sausage, Chinese black mushrooms and some green onions throughout, we found this dish average at best, as it a bit bland and a bit damp as the rice wasn't stir fried until it absorbed all the flavors from the rest of the ingredients. Yingyang rice 陰陽飯 or "ying yang chow fan"
Plating was a bit sloppy, as the duo of sauces were a bit muddled as the dish arrived on the table. Mid sized crisp tender shrimp swim in a béchamel and green onions, while non-descript pieces of chicken/pork? swam in a runny sweet and sour sauce. 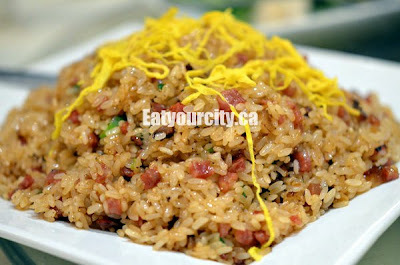 All of this is piled on top of some fried rice. We all agreed that we've had better, so this dish was average. This was the best dish of the night, and not surprisingly, its the award winning fish dish. One of the best fish I've had! 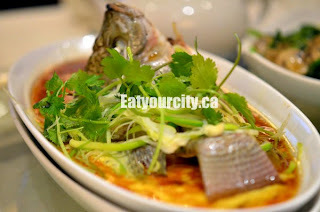 By itself, the fish alone was just a little over cooked and a bit rough textured, but when paired with the silky smooth steamed bed of egg it sits upon and drenched in a sweetened soy sauce, OMG...out of this world!! Definitely lived up to its award, though it would have been over the top if the fish wasn't slightly overcooked. And a picture of their award for the tilapia dish.. mmm! After having a dish made with freshly laid eggs every day on my China trip, I NEEDED more eggs!!! Yes, I wasn't done after having the above delectable steamed tilapia and egg dish. 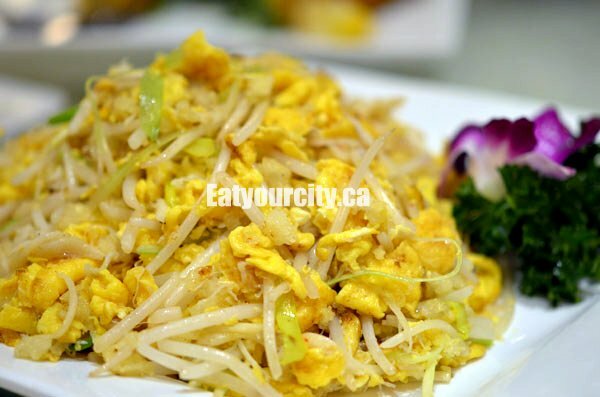 This one didn't really hit the spot, as these was more bean sprouts than the advertised shredded crab meat, small chunks of fish stomach (its a Chinese delicacy) and scrambled egg. 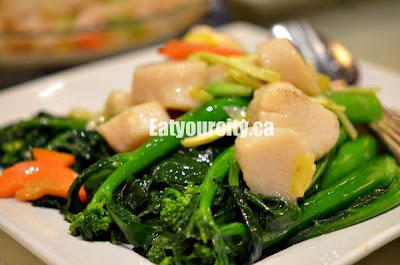 Moving on to your vegetables, large 2-3 cm diameter scallops topped off the nice and crisp-tender gai lan cooked in plenty of garlic and gingerroot infused oil. Scallops were sadly of the frozen variety as we tasted a bit of fishiness (instead of subtle sweetness inherent in fresh seafood). 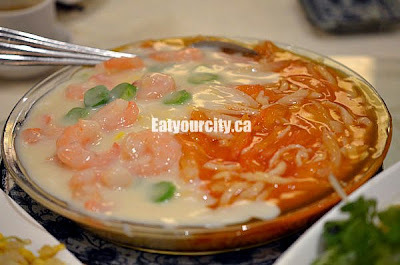 This was also another signature dish from Bing Sheng. The tofu was sooooo silky smooth, with a hit of dried scallops and chunks of chicken for flavor. 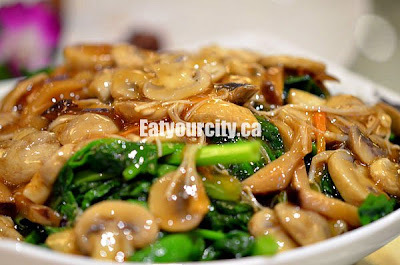 Laced with a generous amount of rich caramelized sauce, this was quite a satisfying dish as it tasted like shark fin soup 魚翅 minus the environmentalists and guilt! 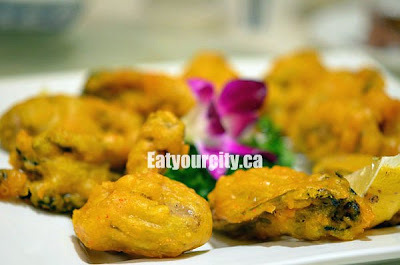 We found these deep fried oysters mediocre, as the batter was bland, and the oysters a little overdone, leaving us with chewy overcooked battered blobs. Ahhh, if only they were as good as the pan seared oysters at Oceania's!! For our second vegetable dish of the night, we had a mess of button and enoki mushrooms with a caramelized brown glaze on top of stir fried yu choy. Average, but hey, I'm not here for the veggies! 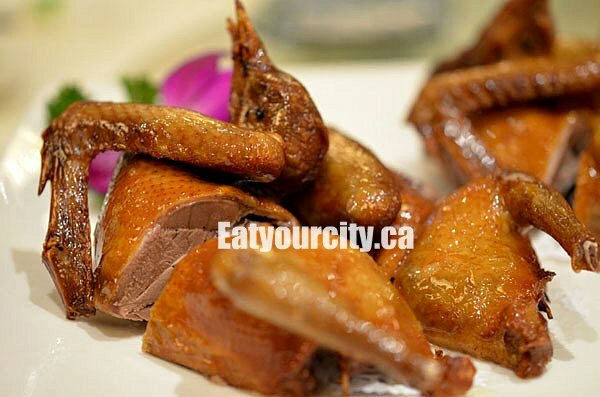 Deep fried pigeon/squab or "Yue Gap"
Considered a Chinese delicacy instead of a pet or an archaic way of passing on secret messages, some of us at the table were craving it, so we ordered it. It's quite inexpensive at this restaurant, but sadly not the best in Vancouver. The birds turned up overcooked, not very juicy and a little tough instead of the juicy succulent duck-like tender gamey meat we were looking forward to. The marinade didn't penetrate evenly, so the bird was short on flavor...except in the in the thighs and wings. 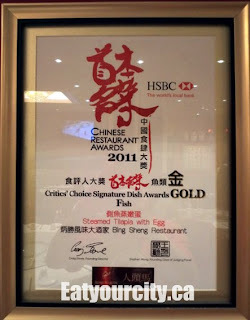 Overall, the award winning dishes are a must try, and a good place to bring out the family to for dinner. There's plenty of room for improvement in their execution of their other dishes before they get the same wow! reaction as their award winning fish dish.